Are these words or statements you have said in the past … or are currently saying? These are statements I hear many times from new clients. But today I want to challenge you. I want to challenge you that if these are statement you are making, you might be in a sense of denial. How can I say that? Because as I begin the process of organizing with these clients and see how scattered their thinking is and the process in which they begin to tackle the project, there is no way they can firmly stand on the concept that the clutter around them is ok and working for them. It is a hard thing to look at and a hard thing to come to terms with. So instead of dealing with it head on, we go into denial mode thinking this way of thinking will get us by. But the reality is, it will eventually catch up with you and cause much stress, unrest, confusion, aggravation and many times conflict within a relationship. 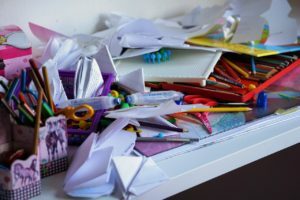 So what is the truth about clutter? Let me first preface that there are many levels to clutter and what may feel like clutter to one may not to another. For me, if there were piles of paper on my kitchen counters, that would be clutter to me and cause me stress. Some people may be ok with a few piles of paper on their counters. What I’m talking about are the piles and piles of papers all over the kitchen that now the kitchen cannot be used effectively for what it’s purpose is … to cook and eat in. What these piles of paper can do is “compete for our attention” (Dr. Jeremy Wolf, ND). Its like every time you walk into the kitchen you are in a battle with your emotions. These piles call for your attention but you don’t have the desire or energy to tend to them. It leaves you feeling unproductive, shameful, confused, overwhelmed and defeated. The piles win! Or what about the bedrooms that are full of piles of clothes that are spilling out of the closets. The closets are so full that there is no more room for clothes so they end up on dresser tops to then be on the floor. This is the type of clutter that causes stress; which then turns into other health issues. When we have days that are affected with the above, it truly brings us down. In 2009, Southern California and UCLA Psychology Professor Rena Preetti did a study on women living amongst clutter. They found that these women had high cortisol levels. Whereas the men living in the same home did not. Boy that doesn’t seem fair. So what does living continually with high cortisol levels do to you? Yikes that can be pretty significant health issues all for the sake of clutter. You have to ask yourself if it’s worth it. Only you can answer that. No one can for you. I’ve had individuals call me because they wanted me to call their spouse or their girlfriends to help convince them they needed to hire me to help with their clutter. Sadly, I had to say no. I cannot do that. I cannot convince anyone they need to change. It has to be their decision. If they don’t own the decision, the organizational process will not be successful. Has clutter now become your friend … but you just don’t realize it’s your enemy? Are you ready to look at your circumstance with new eyes? Do you want to change but just don’t know where to begin? In order to get to … you have to walk through!